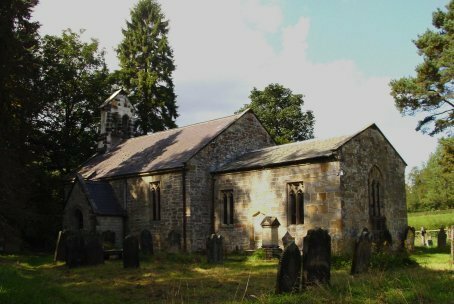 The first church building here dates back to the 12th century, when most of Hawnby belonged to the estates of the Malebiche family, of Acaster Malbis and Scawton. In 1190 Richard Malebiche was the aristocratic ringleader of the mob that massacred the Jews of York. His lands here were confiscated from him by way of punishment. But ten years later he was able to buy them back - for the payment of four saddle-horses, two hawks and two greyhounds. The building was then completely reconstructed in the 14th century. This may well have been due to its being ransacked by the invading Scottish army of Robert the Bruce, and left ruined. 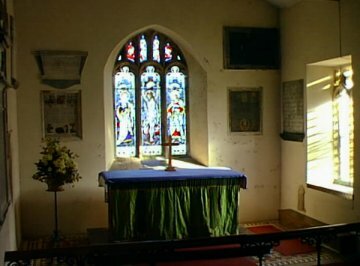 The present chancel appears to be largely 15th century work. 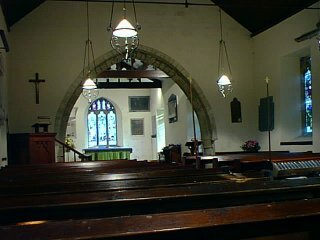 The pews and the ceiling were installed as part of general restoration work in 1871. From the 12th century onwards there was a nunnery just up the road at Arden. After Henry VIII's dissolution of monasteries, the old lands of this nunnery eventually came into the possession of Ralfe Tankarde, whose memorial tablet is to be seen on the south side of the east chancel wall. In 1590 Ralfe Tankarde, along with his "sons, servants and others of his confederates" was charged with high treason. We do not know why. (However, we do know there was a Richard Tankarde of Arden ordained as a Roman Catholic priest in France a few years previously - so perhaps it had something to do with the religious conflicts of the period). At all events, it seems that Ralfe was then cleared of the charge, for he was still in possession of the estate when he died. From the other memorials to the same family it will be seen that they later changed their name to Tancred: a more Latin-sounding name, and therefore (as it would then have been perceived) altogether more elegant. Arden Hall remained the home of the Tancreds until 1897 when it was bought by the 6th Earl of Mexborough. It remains a puzzle why the church was built here, so separate from the village, but why is the village itself in two halves? This we do know. One fine summer's day in the mid-18th century two Hawnby men called Chapman and Cornforth were labouring up on the moor. Having had some lunch there, they lay down to snooze. But when they awoke, and compared notes, it turned out that they had both dreamt vivid dreams. Both alike had dreamt that God was speaking to them, urging them to repent and be converted. That evening they went to consult with their friend John Hugill, a farmer at Ladhill Gill, and it turned out that he too was feeling the same. Then - as they were wondering what to do - a newspaper appeared in the village, in which it was announced that the famous preacher Mr. John Wesley was shortly to preach at Newcastle upon Tyne. At once, the three men set off - up the drove road - north. They walked the whole way to Newcastle. (At an inn on the way, it is recorded, they tasted tea for the first time - and liked it!) They heard Mr. Wesley, and then walked home again: the first Methodists in the neighbourhood. The then Lord Tancred, however, was a Church of England man who didn't approve of Methodists. He was their landlord - and he immediately expelled them from their homes up on the hill. The only place they could settle was down by the bridge. On July 7th 1757 John Wesley records in his diary how, from Osmotherly, he "rode over one of the pleasantest parts of England to Hawnby". And he remarks that the "zealous" landlord's action had actually turned out to be "a singular kindness": as it had served to create such a vibrant little community of 40 or 50 Methodists, all living together there. 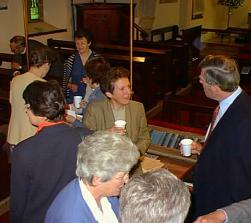 If you would like to read a fuller account of the Hawnby Dreamers and about the 'Hawnby Dreamers Day' first celebrated in 2002 follow this link. 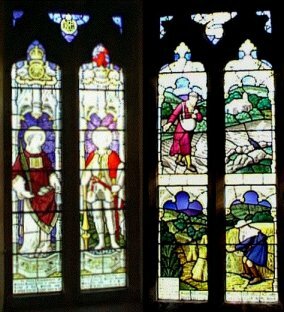 The rather fine stained glass window in the south wall, showing a view of the church, commemorates the Revd William Hughes, "the fighting parson of Hawnby" at the time of the First World War and his wife Mary. The window in the north wall commemorates their three sons, all killed in that war. Strongly encouraged by Mr. Hughes, in fact, almost all the young men of Hawnby joined up to fight. And the war memorial records the large proportion who died. Meanwhile, on the other hand, we should perhaps also honour the memory of Heinz Hausner, Syrius Herd, Ernst Weiderer and Karswig Hupe: the four German airmen killed when their Dornier bomber was shot down in December 1942 on Easterside Hill, just north of High Baniscue Farm. All Saints has recently become a 'poetry shrine' - a place where poetry may be found and read, but also a place where poets may leave their work for others to see. Follow this link to find out more. On Sunday 19th June 2005 more than a month's rainfall (70mm) fell in under three hours on the North York Moors above Hawnby. This created a flash flood which came down the River Rye with tremendous destructive force. The church was flooded and many of the headstones in the churchyard were laid flat. In Hawnby village the bridge and several properties were badly damaged. The devastation continued into Helmsley and beyond. 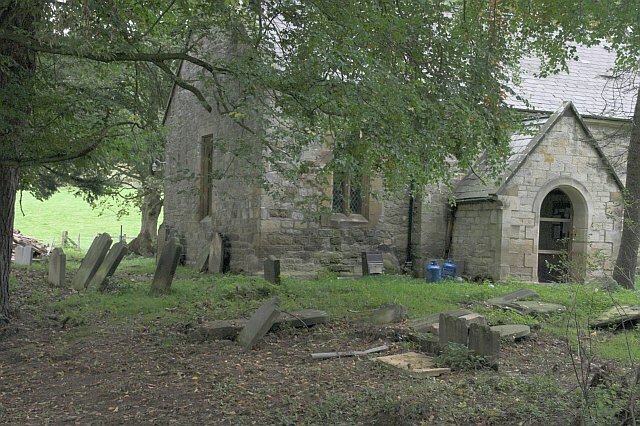 In 1979 Hawnby, having previously been a parish united with Old Byland, was incorporated into the newly created Upper Ryedale parish, also including Bilsdale Midcable, Scawton and Cold Kirby. 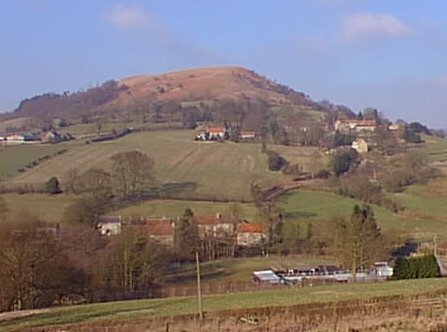 The total parish has a population of not much more than 450; considerably reduced from the time (still within living memory) when Hawnby alone had a village school with almost a hundred children in it. Still we continue to hold regular services here, at least once a month, usually more; cheerfully singing our hymns to the electronic accompaniment of Lincoln Cathedral Choir. Visitors are very welcome to join us.